Thanks for coming back to my real estate blog for the latest post ladies and gents. As you have probably all guessed by now, I prefer to blog about the alternative side to property and real estate as opposed to the more conventional topics that most bloggers of my elk tend to stick to. Well today is another prime example of that tendency as this post is going to be all about living off grid through the utilisation of affordable renewable energy. You must all have come across this living concept before, whether it be via a news report, documentary or magazine article. But how many of you actually know someone who has adopted this lifestyle. I would wager very few you. It is fair to say that people living off grid are still very much in the minority. But why is that? It sounds idyllic right? Being at one with nature and doing you bit for the environment? But when push comes to shove, detaching yourself from the accepted way of living is more daunting than you may think. But that needed be the case. Let’s take a closer look at the living off grid premise and see if we can’t debunk some of the common myths surrounding it. 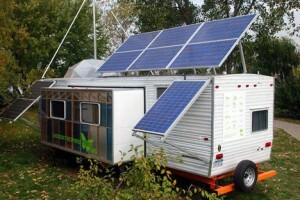 Many people these days are looking to live off grid for a number of varying reasons. Some wish to live a freer less regulated way of life while others want to reduce their carbon footprint and have less reliance on the big power companies. Others need to do so out of necessity (ranchers, farmers or miners in vast countries with remote locations such as Australia or the US) while some embrace the off grid concept purely for holiday home and vacation purposes, in place of a mobile home. Whatever the reason, there is definitely a liberating aspect to living off grid, which is why many people are inspired by the concept. But there are 2 major considerations to be taken into account before doing so; how will you source water and how will you create energy? There are a number of options available to the aspiring off grider. So let us take a look at them in order of popularity. The most popular sources of off grid power are wind, solar, biodiesel and natural gas. Hydro is also an option but requires the necessary natural occurrences, like a stream or river, to be present. In the case of wind, a wind turbine can be set up to harness the natural power f the wind to power your home. The power can also be stored using a battery storage setup for constant availability. Solar is also very popular and effective, especially when combined with wind. Solar panels can be used to heat water and power a home. As with wind, the power created can be stored using a suitable storage battery unit. A diesel generator can be converted to run on biodiesel that can be manufactured onsite using decaying matter. As such, it is a renewable source of energy. Biomass incinerators and/or boilers are also an option although these are obviously less kind to the environment. Who Is Living Off grid For? So folks, I hope you have enjoyed my overview of off grid living and renewable energy. Did you find it informative? Be sure to drop me a line and let me know at the usual address. Also, if you would like me to cover a particular topic in future blog posts to tap me up about it. Either send me an email, a Tweet or comment on our Facebook page. Either way, I will endeavour to bring you the articles you desire. Until next time folks. Take care out there!